LOCATION.--Lat 40`38'28", long 75`22'47", Northampton County, Hydrologic Unit 02040106, on right bank 40 ft downstream from highway bridge at entrance to Monocacy Park at Bethlehem, and 2.1 mi upstream from mouth. GAGE.--Water-stage recorder and crest-stage gage. Concrete control since July 17,1969. Datum of gage is 247.24 ft above National Geodetic Vertical Datum of 1929 (levels by U.S. Army Corps of Engineers). 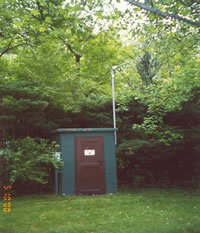 Prior to May 15, 1962, non-recording gage at site 40 ft upstream at same datum. Recording gage at upstream site May 1962- Dec 1967. Recording gage at present location since Jan 1968. Satellite telemetry at station. COOPERATION.--Station established and maintained by the U.S. Geological Survey. Funding for the operation of this station is provided by the Lehigh County Authority, the Pennsylvania Department of Environmental Protection and the U.S. Geological Survey.